"We know because we've been there"
Diversity is the new landscape of our ever changing world. Increased diversity in organizations is creating interpersonal challenges and conflict. Promotion of respect and understanding of all situations is a realistic need of our organizations to maintain a productive workforce, keep morale high, and avoid lawsuits arising from lack of understanding. The Ontario legislature has passed Bill 107. The Bill, now known as the Human Rights Code Amendment Act, 2006 received Royal Assent on December 20, 2006. Under this legislation, as of June 30, 2008 individuals will be able to file human rights complaints directly with the Human Rights Tribunal of Ontario. These important changes to the Ontario Human Rights Code will affect everyone in Ontario and organizations in particular. Now, more than ever, it’s important for companies and organizations to understand their duties and responsibilities under the Code. Education is a proven method of creating, repairing, and maintaining a positive environment. We provide high energy dynamic workshops on diversity, human rights, harassment, sexism, gender identity, sexual orientation, and ability/disability. Working with corporations, business, social agencies, schools and community groups to bring an awareness of diversity, equality and respect for all people. 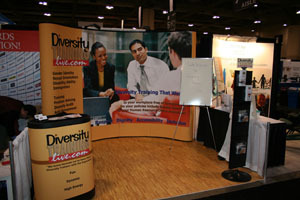 Diversity training is training provided with the stated purpose of problem solving (educating all parties around a discrimination or harassment issue) and treating diversity as an opportunity and promoting the ability of members (often students, employees or volunteers) from a great variety of backgrounds to cooperate productively and make as great a contribution as possible to organizational goals.